Home » Business » Why iPhone 5S is Selling More than iPhone 5C? Why iPhone 5S is Selling More than iPhone 5C? The Apple iPhone 5S is outselling the iPhone 5C which Apple introduced to capture the mid-range smartphone market. Looks like people who money always prefer the more advanced and expensive iPhone 5S rather than the iPhone 5C. The iPhone 5S had broken all previous sales records. Apple must now be in quite a odd situation as they decide how they must react to this situation. Happy or not-happy? The sales ratio between the iPhone 5S and the iPhone 5C is two to one. 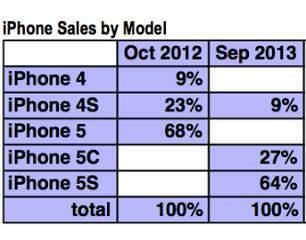 More than double numbers of iPhone 5S models are sold till now than iPhone 5C. According to the latest survey by Consumer Intelligence Research Partners (CIRP) that a total of 64% iPhone 5S models were sold during last days of September while iPhone 5C only accounts 27%. It means that iPhone 5S outsells iPhone 5C. But current situation shows that iPhone 5S is twice more popular than iPhone 5C during initial days of its launch despite of its higher price. What might be the reason of iPhone 5C lower sales? The one clear cut factor is its high price against its plastic body and low-end features. But will the situation remains same with passage of time? CIRP co-founder Josh Lowitz thinks that it will change. Since Apple has introduced the iPhone 5C in quite a different market where Apple isn’t a familiar name it will take quite some time to set it and start showing the numbers. Announcement to be made on 'God Particle' next week ? Winner of Live Roach-Eating Contest Dies! Next: Gold iPhone 5S Sells for $10000 at eBay! G.M. Recalls 1.5 Million Cars and Trucks!